Book and podcast reviews, museum exhibitions and anything else that springs to mind. The quote on the front of the book says “If you only have time to read one book on the great man, you should make it this one”. I wouldn’t entirely agree with that. 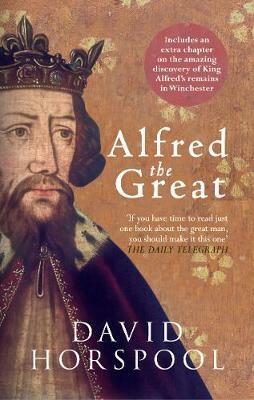 David Horspool’s book is largely a critical review of the myths and legends about King Alfred. It doesn’t give a chronological narrative of Alfred’s life; there’s none of the the colour and myths and grandeur with which he often appears – but it is none the worse for it. The real historical evidence and the growth of the legend are covered, and with some wit. There’s a memorable phrase where Horspool describes the Victorian ideal of Alfred as a “Anglo Saxon head boy king”. There is great detail on contemporary sources like Bishop Asser; on Matthew Parker, the Tudor archbishop who used the myth to boost the newly independent Church of England; and on later romantic portrayals in painting and theatre, all the way up to Bernard Cornwell’s Last Kingdom and the 1969 epic film starring David Hemmings, Michael York and Ian McKellan. This “biography” of John Hawkwood by Frances Stonor Saunders is a great read. Released by Faber & Faber in 2005, the book presents itself as the story of an English mercenary who made his name fighting first in the Hundred Years War, and then in medieval Italy. Actual biographical details of the famous mercenary may be short on the ground but it turns out these aren’t really necessary, Saunders gives a wonderful description of the mercenary life among the warring states of Fourteenth Century Italy. I’ve decided to give a short review of Mark Antony, A Plain Blunt Man by Paolo de Ruggiero, released last year by Pen & Sword. I’m a bit wary of doing this as I have no history qualifications whatsoever, but the author of this book is (according to his bio in the book jacket) a business executive at a multi national corporation, rather than an academic, so I feel like I may as well have a go. While not an academic, de Ruggiero says he did grow up in Rome in a family of academics and has been passionate about Roman history all his life. For better or worse that passion definitely shows throughout the book.